Q: On October 13, the United Nations Educational, Scientific and Cultural Organization (UNESCO) held the last round of voting for its next Director-General. The former French Culture Minister Audrey Azoulay was nominated as its new chief. What is China's comment on this? A: The Chinese side congratulates Ms. Azoulay from France on being nominated as the next Director-General of UNESCO. We believe that under the leadership of the new Director-General, UNESCO will continue making contributions to upholding world peace, promoting sustainable development, enhancing exchanges and mutual learning between civilizations and building a community of shared future for mankind. The Chinese side values the status and role of UNESCO and will as always continue taking an active part in and supporting the work of UNESCO and its Director-General and promoting the development and cooperation of UNESCO. Q: It is learned that on October 13, the Organization for the Prohibition of Chemical Weapons (OPCW) nominated Ambassador Fernando Arias González, the Permanent Representative of the Kingdom of Spain, as its Director-General based on consensus through consultation and it is scheduled to formally appoint him at the end of November. What is your comment on this? A: For a long time, the OPCW has played an important role in the prohibition and destruction of chemical weapons. The Chinese side congratulates Ambassador Arias, the Spanish candidate, on being nominated as the next Director-General of the OPCW. The Chinese side will as always support the relevant work of the OPCW, step up its cooperation with the OPCW and make concerted efforts to promote the realization of "a world free of chemical weapons". Q: Iraqi forces have advanced into Kirkuk. Does China have any comment? A: I need to verify the report mentioned by you. In principle, the Chinese side supports the efforts made by the Iraqi government to maintain territorial integrity and national stability and solidarity. We also hope that all relevant parties can support Iraq's territorial integrity and national peace, stability and solidarity. Q: Today, the naval forces of the ROK and US launched the joint military exercises in the eastern and western waters off the Korean Peninsula. What is China's comment on this? A: Currently, the situation on the Korean Peninsula remains highly sensitive and tense. 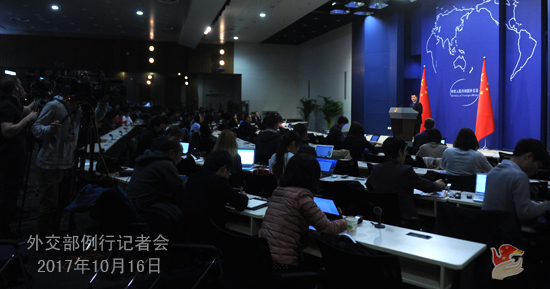 If this kind of situation persisted, it would not serve the interests of any party, especially the regional countries. In view of this, we hope that all relevant parties can exercise restraint and strive to make the current situation move towards the direction of abatement and the resumption of dialogue instead of doing the opposite. Q: According to media reports, on October 14, the deadliest single attack ever witnessed in Somali hit its capital, Mogadishu, killing at least 276 people and injuring around 300 others. The President of Somali Mohamed Abdullahi Mohamed declared three days of national mourning. What is China's comment on this? 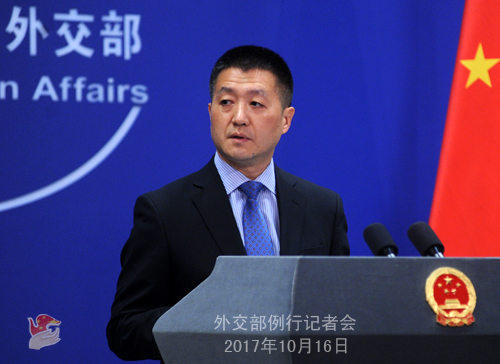 A: The Chinese side is appalled by and strongly condemns the truck bomb attack in Mogadishu, the capital of Somali on October 14 and the heavy casualties caused by it. We deeply mourn for the unfortunate victims and convey our sincere condolences to the injured and the bereaved families. The Chinese side is firmly opposed to all forms of terrorism and will continue steadfastly supporting Somali's efforts to combat terrorism and maintain national security and stability. We are willing to bolster cooperation with Somali and other African countries so as to jointly address the threat and challenge posed by terrorism and continue playing a constructive role in the peace, security and stability of Africa. Q: In about 45 minutes time, it can be the deadline for the leader of Catalonia to declare or not declare independence. Should he choose to declare independence, he can't probably count on support from Europe. Can he count on support from China? A: China's position remains unchanged on the issue of Catalonia. I would like to reiterate that the Chinese government understands and supports the efforts made by the Spanish government to uphold national unity, ethnic solidarity and territorial integrity. We believe that the Spanish side is capable of safeguarding the social order and civil rights and interests in accordance with law. China and Spain have friendly relations. We will continue developing friendly cooperation with Spain in various fields in the principle of respecting each other's sovereignty and territorial integrity and non-interference in each other's internal affairs. Q: In Venezuela, the ruling party claimed a landslide victory in regional elections, but the opposition says that it does not recognize the result. Does China support the government of Venezuela? A: We have taken note of the relevant report. We have also noted that the elections were conducted in a smooth manner. 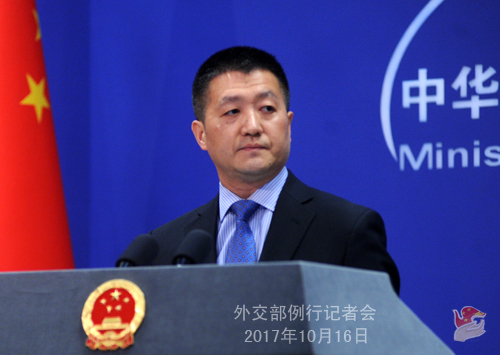 The Chinese side always follows the principle of non-interference in any other country's internal affairs and believes that the Venezuelan government and people are capable of handling their own internal affairs through dialogue and consultation within the legal framework and maintaining domestic stability and prosperity.